We have made an update on the PvP gearing process to make it less tedious and more rewarding when one buys a new PvP item or goes from Season to Season. Also updated the Daily PvP Quests. Last edited by Jinha; 08-10-2018 at 09:13 PM. Could we do an exchange for the s11/s12 tokens people were saving up but are now useless? Last edited by lordvolom1; 08-11-2018 at 05:46 AM. I'd really appreciate an exchange vendor for honor or arena points for old tokens, dope update though! Should add exchanging bg tokens for s4 tokens as well. The problem with the "don't add vendor to refund for s3" idea, is that people who have spent AP on those a day before, or week before, have now lost those arena points because they were not told beforehand these would be useless in the upcoming update. I'd like to see it be that way, but I can see why also people would not want it. It's really just up to them to decide, but it would also just make people gear much quicker if they have a lot because they saved up for a weapon or some other gear piece. The new stats the have been implemented need to be implemented on all prior seasons aswell. Example: Rogue legs now have 13k expertise in season 4, the expertise needs to be adjusted in s3, s2, s1. This needs to happen with most classes, as it looks like it was forgotten. Last edited by lordvolom1; 08-11-2018 at 10:31 PM. I would also suggest looking into healing in pvp, as with the new gear update, healers are a lot more tanky since they can run a lot of pvp gear now (while healing pretty much the same), I've had multiple healers tell me heals are currently too good. 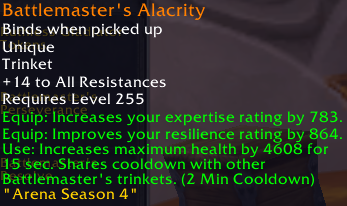 And maybe the way to go about "fixing" pvp gear wasn't to add more haste to it for some classes, as each class has more than enough haste already in my opinion, I understand you did this so people would use pvp gear instead of ulduar/pve, but I don't think it's the answer. I also think increasing haste in pvp is bad because it discourages kicking peoples casts, as currently it's super hard to do, and is supposed to be a big part of pvp. I could be wrong. Last edited by lordvolom1; 08-13-2018 at 04:53 AM.